Connectivity, security, costs and bitcoin usage are among the key issues to be resolved as India moves towards a digitised economy. Mobile-based digital payments have been growing phenomenally worldwide. Around 23 per cent of global consumers have adopted it, according to surveys, while among early users of smartphones, the figure is 35 per cent. The Scandinavian nations - Norway, Sweden and Denmark - as well as the UK, France and Belgium are well on their way to becoming entirely cashless. Close on their heels are Canada, Australia and South Korea. India is way, way behind, but with the acute cash shortage following the demonetisation decision, it is expected to also take a quantum leap in the same direction soon. What are the main concerns as usage of e-wallets and plastic money multiplies and bitcoins grow in popularity? The first major challenge to taking the cashless economy to every corner of the country is poor Internet connectivity and limited smartphone penetration. "The basis of digital currency is connectivity," says Tejasvi Mohanram, founder and CEO of credit decisioning and disbursal platform, RupeePower. "Unless net connectivity improves radically in rural areas, online transactions can never become a way of life." Not surprisingly, e-wallet companies like Paytm and MobiKwik are trying to overcome the problem in different ways, but as long as connectivity remains sporadic or limited, a cashless economy will be a distant dream. "We have launched a lighter version of MobiKwik called MobiKwik lite, which can even be used by old smartphones with low data connectivity," says Bipin Preet Singh, Founder-CEO and Director, MobiKwik. "A mechanism by which even feature phones will be able to make payments using SMSs is also being worked on." A second key concern is security. Reports of debit cards being hacked into have raised fears of people losing their entire bank savings. Strict government guidelines on security could help allay them. Multi-factor authentication - in which two or more pieces of correct evidence have to be provided before being allowed access to a bank account - may be cumbersome, but it makes all the difference to security. But conversely, to encourage the shift to digital banking, it has also to be made as easy and seamless as possible and doing so without compromising security presents another vital challenge. Steps like doing away with two factor authentication for low value transactions - say, below Rs 2,000 - are rightly being considered. Interoperability of e-wallets, or incorporating e-wallets in the unified payment interface (UPI) of banks, is another means of making net banking easier. 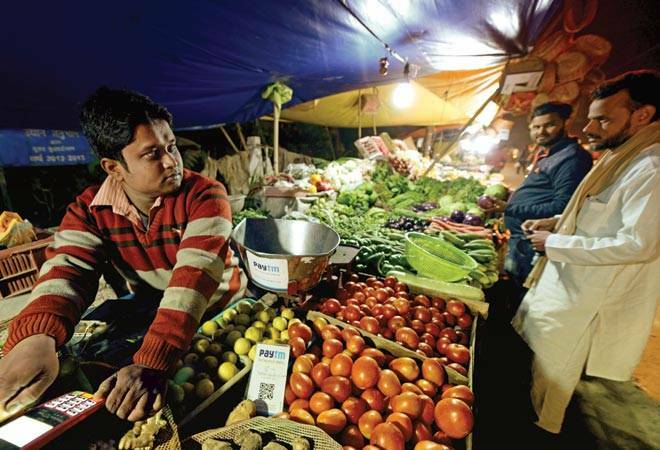 "India is going past the debit and credit card phase and moving to payments through smartphones using the QR code or through feature phones which work on USSD," says Sunil Kulkarni, Deputy Managing Director of e-wallet company Oxigen. "It is expected that by January 2017, there will be just one QR code for RuPay, MasterCard, Visa and Oxigen wallets. Digitally enabled payments using biometric authentication will bypass the card system." All this will make the shift to a cashless economy easier. As the number of online transactions, and indeed of bank accounts, increases rapidly following demonetisation, it is crucial to have adequate infrastructure to handle the load. It is a lot like demand forecasting - the likely growth has to be anticipated and prepared for. The system has to be such that capacity increase can be fast and seamless. "Developed countries already have the required infrastructure for high transaction volumes in online banking," says Mohanram. "We need to look at those. It is just a question of having the right set up." MobiKwik is already making preparations. "We have readied our systems to seamlessly manage transactions for up to 300 million users," says Bipin Preet Singh. There are two major 'charges' associated with digital currency. The first is the cost of owning it. This could be in the form of annual fee for credit/debit cards or e-wallets or the card swipe machine. Currently, e-wallets and debit cards are free, and so are some of the credit card variants. The second is the transaction charge, with payment networks like Visa and MasterCard charging between one and three per cent on each transaction. While high margin businesses such as shops in malls absorb this, local kirana stores - once their use of card swipe machines or e-wallets rises - could well pass this on to the customer. This in turn would prompt the latter to prefer paying cash. "Transaction charges cannot be completely done away with, but they should be kept low enough that the convenience of using cards or e-wallets outweighs the small additional expense," says Mohanram. In any case, card charges in India are one of the lowest in the world. The government is also trying to come up with incentives to encourage cashless transactions. With 90-95 per cent of transactions below Rs 2,000, there is a proposal to keep charges for such transactions at 0.5 per cent and for those below Rs 1,000 at 0.25 per cent. "At present, the cash component of India's $1.3 trillion economy is 95 per cent," says Kulkarni of Oxigen. "Around five per cent of this, or $65 billion, is now expected to move to the digital stream. This is huge, considering the entire e-commerce business in the country is worth around $20 billion."